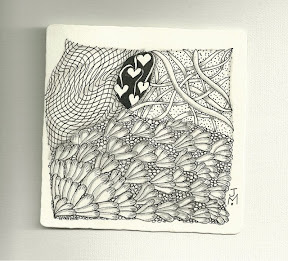 This week's challenge was to explore the new tangle, Sanibelle by Tricia Faraone, CZT. It took me a bit to get used to Sanibelle. It took me a while to get into the groove, but I ended up up having a lot of fun and liking the result. I also used Hollibaugh, Heartvine, and a Static variation (crossing them...I think there might be another name for this tangleation). Thank you Tricia, and a big thanks to Laura, aka the diva, for having folks send in their new tangle patterns. So much fun! Interesting thing, when I went back to look at the directions I noticed how different my version ended up. Huh. Thank you. It's always fun to see how the tile ends up. Different is beeaaauutiful. Love your little Heartvine peeking in. Happy Valentine's Day to you! And a happy valentines day to you as well!